Interview Archives - Page 3 of 4 - Florence is You! When you visit London one of the must to go cultural spots you can’t miss is the Victoria & Albert Museum of course. The Museum is the world’s leading of art and design, home thousands years’ worth of amazing artifacts from many of the world’s richest cultures, it is always impressive with all its galleries, permanent collections, and temporary exhibitions. As part of the Museum the V&A’s Fashion Collections is the largest and most comprehensive collection of dress in the world. During my last visit I had the opportunity of having a nice talk with one of the protagonists behind the scenes: Sonnet Stanfill, curator of the 20th Century and Contemporary Fashion Section. We met Tommaso Sacchi in Florence, the place where he lives and works. Tommaso is not only a curator, organizer and consultant in the creativity and artistic production field, but also an elegant young man, full of style. While we are talking, I observe him, dressed in a light shirt and blue jacket, of modern taste but with a vintage touch, while he tells me about his life. His path is very rich and interesting: at only 32 years old he has had a series of experiences that span across the entire cultural sector and has collaborated with personalities of great importance, in Italy and also abroad. 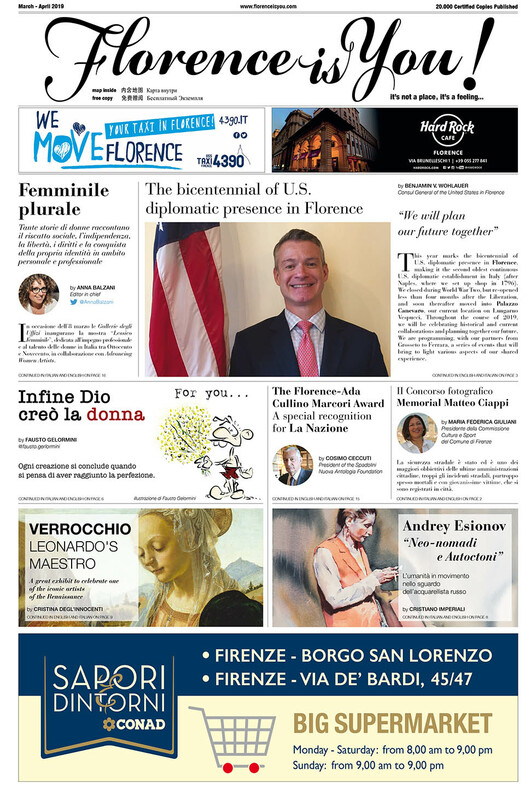 We all should pay a tribute of grate gratitude to the person I am about to introduce to you and to the generous members of the nonprofit American Foundation who has founded and presides Friends in Florence. Using only private funds, Friends of Florence takes care of our extraordinary cultural and artistic patrimony since 1998, using a lot of resources for monumental restoration, being animated by genuine civic spirit. Every year twenty thousand euro are given to the Accademia Gallery for the maintenance of David and the Prisoners of Michelangelo; it was Friends in Florence that were the leading agents to participate in the restoration of the Uffizi Tribuna, the Crucifix of Giambologna from the SS. Annunziata Chapel, in important interventions in the churches of S. Spirito, SS. Annunziata, S. Croce, in Florence’s museums, in the diagnostic campaign realized by the Opificio delle Pietre Dure regarding the disappeared fresco of Leonardo’s Battle of Anghiari.